How did the idea of going into business come about? I have a degree in acquaculture and I spent seven years in that industry, including two years in New Zealand. I considered building kennels some years ago as I could see there was a gap in the market, but I knew it would take some time to find the right location. In the meantime, I decided to train as a dog groomer. I felt that being self-employed would give me flexibility with childcare and I have always loved dogs, so it seemed a natural progression. How did Groomlands get off the ground? When we found our current home i set up Groomlands professional dog grooming while also planning for the kennels. It took approximately four years to investigate, plan build and finally complete the kennels, which opened for business last September. I knew that other kennels in Moray were busy and felt there would be room for one more if I created something a little different. Our kennels are light, airy, spacious and modern, where the dogs come first and enjoy a homely atmosphere. I chose to keep them small with 11 units to enable me to spend quality time with the dogs. Who helped you get started and develop your business? My whole family have been a huge support throughout the process and helped me to realise my dream. Lorna Williamson from Business Gateway in Moray, gave me vital support by helping me with business, and more specifically, financially planning as well as research to ensure I had thought it all through. This led to me being able to raise the necessary capital from RBS to make the project happen. Dogbox, kennel manufacturers, also helped provide a fantastic building. I wanted to create kennels where the dogs are happy and contented and judging by the feedback from customers, I think for the most part I have achieved this. I have made some mistakes as we all do, but none I would say stand out. What is the biggest challenge facing your business? Getting the business known in a timely and cost effective manner and making sure that the website and social media sites are up to date and current. What would help your business? Current and previous customers spreading the word, as experience has told me that word of mouth is the best advertisement. What do you still want to achieve for your business? 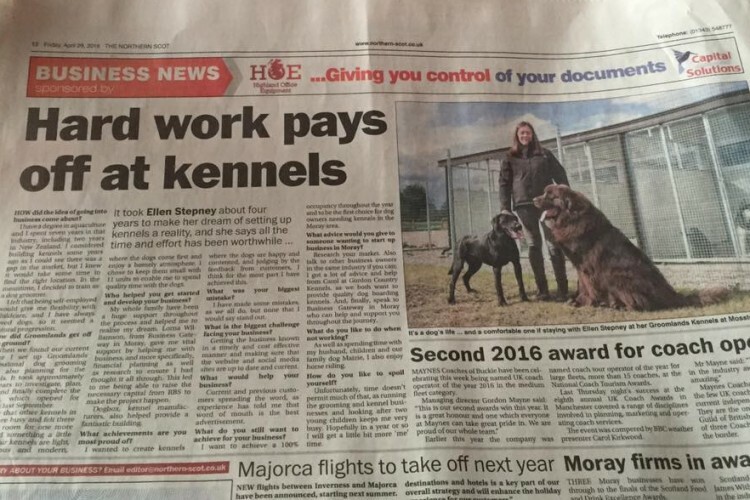 I want to achieve a 100% occupancy throughout the year and to be the first choice for dog owners needing kennels in the Moray area. What advice would you give to someone wanting to start up business in Moray? Research your market. 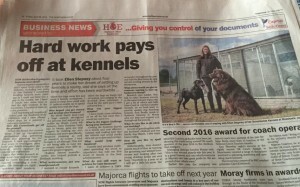 Also talk to other business owners in the same industry if you can; I got a lot of advice and help from Carol at Gordon Country Kennels, as we both want to provide quality dog boarding kennels. And, finally, speak to Business Gateway in Moray who help and support you throughout the journey. As well as spending time with my husband, children and our family dog Maizie, I also enjoy horse riding. Unfortunately time doesn’t permit much of that, as running the grooming and kennel business and looking after two young children keeps me very busy. Hopefully in a year or so I will get a little bit more “me” time.